EPICURE, a food service solution brand of Spotless, and AE Smith already work together at one of Australia’s most famous venues – the MCG. “Customers know and trust the quality of service we deliver at AE Smith,” said David Willett, AE Smith CEO. Spotless is an Australian owned, managed and operated provider of integrated facility management and single service solutions. environmental services, cleaning and many more. AE Smith delivers the HVAC and refrigeration servicing to the venue and EPICURE manages the catering and hospitality for thousands of patrons. Whilst both contracts continue to be managed separately by the MCC, there are advantages of having a close working relationship. day, they’ll be the ones facing the unhappy patrons,” said Adam Godino, Refrigeration & HVAC Project Sales, Melbourne Service. “By having a strong relationship and good communication with EPICURE, we can quickly identify the issue and find a solution to present to the MCC for approval,” added Adam. It’s always been the AE Smith way to collaborate with other suppliers in order to achieve the best outcome for the client. Becoming part of Spotless reinforces AE Smith’s ability to influence the best outcome by recommending trusted suppliers with experience and expertise. A recent project at the MCG highlights the advantage of a close and collaborative working relationship between client suppliers. 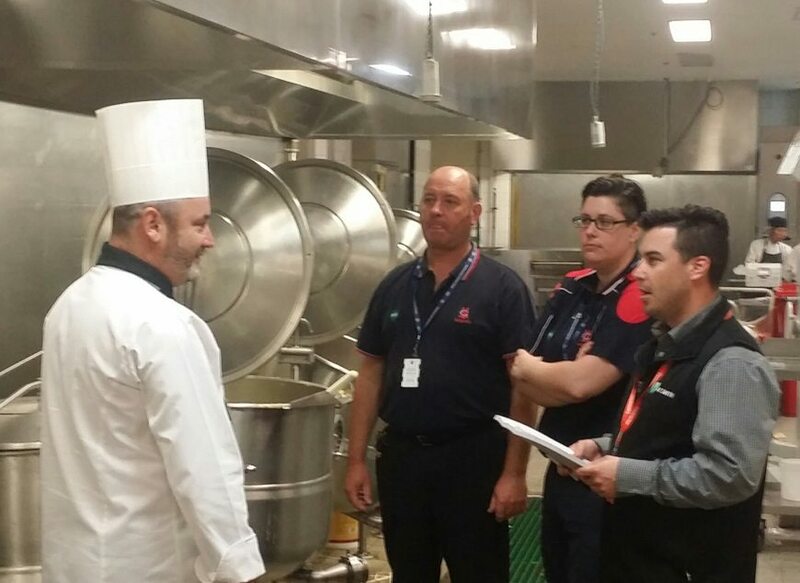 AE Smith was due to replace a steam boiler that supplies equipment in the EPICURE operated MCG kitchens. Before proceeding, AE Smith’s Adam Godino, MCC Facilities Operations & Contracts Manager Marshall Holding, MCC Facilities Asset Coordinator Peta Logan, MCC Facilities Building Services Engineer Steve Bullen and EPICURE’s Director of Culinary Operations Peter Haycroft sat down together to determine if there was a better solution. “We undertook an energy review of equipment in the kitchen over a number of months and we realised we could reduce energy usage by replacing some of it,” said Adam. The new state of the art cooking equipment includes a Brat Pan and an agitated kettle with in-built mixer. It will deliver on the OHS, food safety and power needs of a modern kitchen. “Now we can cook higher volumes of soft soups and sauces, as well as make pie mixes and casseroles, even stir-fries,” said Peter. “Our management team are committed to finding a better way for our clients. Working together with Spotless, we’re supercharged to deliver on this promise,” concluded David Willett.